History: This company has been producing the Megapak, Mega TriPak game bundles for several years. Now they are breaking into producing their own games instead of marketing other company’s older and lesser titles. And they have three games on their plate right now. Plot: Travel again to the time of square sail ships with four masts, when sailors went aloft to work the canvass. 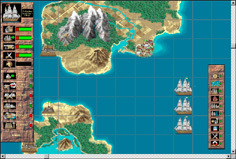 Your ship is sent out to rid the seas of the vermin that inhabit it, specifically pirates. Not only do you have to deal with the pirates themselves, but you must determine what nation is financing the piracy. Turkish naval Commander Piri Teis devised a naval battle game to improve the capabilities of his commanding officers. If the Captains did not do well in the game, Piri felt they would not do well in the real battle. Take the role of one of Piri’s captains and develop your skill in the great game of the sea. Gameplay: The battles are not just on the seas. Build and Arm forts and ships to guard seaports and narrow straights. Ships to command: Eleven different sailing vessels can be purchased or built, from the swift Corvettes to the massively destructive triple-decker Battleships. Missions: Planned missions can be attempted with different ships where capture or defense of land, fort, ports, forts, and homes are the objectives. Multiplayer: Null modem, network, or internet play supported for multiple human players.